Since the first robotic assisted surgery in 1985, the number of procedures performed annually has steadily increased. Bibliometric analysis highlights the key studies that have influenced current practice in a field of interest. We use bibliometric analysis to evaluate the 100 most cited manuscripts on robotic surgery and discuss their content and influence on the evolution of the platform. The terms ‘robotic surgery,’ ‘robot assisted surgery’ and ‘robot-assisted surgery’ were used to search Thomson Reuters Web of Science database for full length, English language manuscripts. The top 100 cited manuscripts were analyzed by manuscript type, surgical specialty, first and last author, institution, year and journal of publication. 14,980 manuscripts were returned. Within the top 100 cited manuscripts, the majority featured urological surgery (n = 28), followed by combined results from multiple surgical subspecialties (n = 15) and colorectal surgery (n = 13). The majority of manuscripts featured case series/reports (n = 42), followed by comparative studies (n = 24). The most cited paper authored by Nelson et al. (432 citations) reviewed technological advances in the field. The year and country with the greatest number of publications were 2009 (n = 15) and the USA (n = 68). The Johns Hopkins University published the most top 100 manuscripts (n = 18). The 100 most cited manuscripts reflect the progression of robotic surgery from a basic instrument-holding platform to today’s articulated instruments with 3D technology. 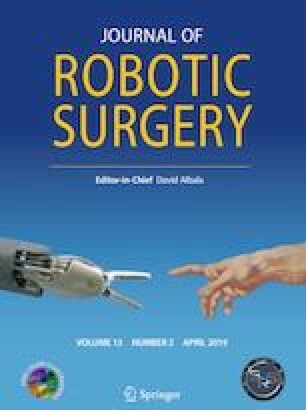 From feasibility studies to multicenter trials, this analysis demonstrates how robotic assisted surgery has gained acceptance in urological, colorectal, general, cardiothoracic, orthopedic, maxillofacial and neuro surgery. Drs. Tara M. Connelly, Zoya Malik, Rishabh Seghal, Gerrard Byrnes, J Calvin Coffey and Colin Peirce declare that he/she has no conflict of interest. This article does not contain any studies with human participants performed by any of the authors. This article does not contain any studies with animals performed by any of the authors. This article does not contain any studies with human participants or animals performed by any of the authors.